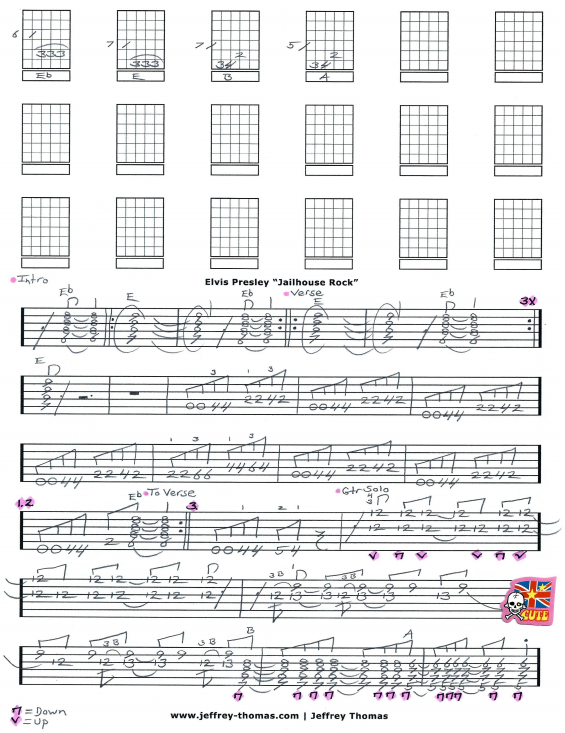 Elvis Presley Jailhouse Rock Free Guitar Tab by Jeffrey Thomas. I followed the classic original recording for this guitar tab so you can play it like it is. Learn all the signature rhythm licks and solo with this solid arrangement for one guitar. Scotty Moore was the guitarist who played on Jailhouse Rock and other Elvis classics. His guitar work on this tune is ahead of it’s time with bends and unique note choice. If you would like the full guitar tab for free just submit your email address through the form provided and I will send it to you. Complete the Schedule A Free Lesson form if you would like to set up a free Skype guitar lesson. “Jailhouse Rock” is number #67 on Rolling Stones list of The 500 Greatest Songs Of All Time! Find more great online guitar tabs on my tab, video and blog pages.